Skinny Cow Ice Cream Sandwiches – The Perfect Summer Dessert! When summertime rolls around, you always want a tasy snack that will melt in your mouth and engulf you with a delicious flavor. One dessert I love all year round is ice cream – I’ll eat it with cake, add toppings or immediately right after pizza. I don’t think there is a flavor I don’t like, so I am always open to trying new things. Glamour sent me on a Glambassador mission to try Skinny Cow desserts. 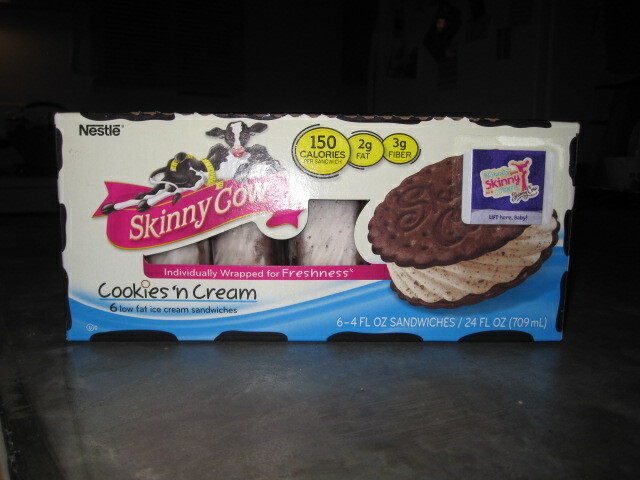 I bought a box of Skinny Cow Cookies ‘n Cream ice cream sandwiches and I must say they are soooo delicious! Six sandwiches contained in a very colorful box, it’s the perfect bite size snack that has 150 calories, 2 grams of fat and 3 grams of fiber. I can’t even taste a difference in the ice cream, but all I know is that I wanted to eat a couple more of these but decided against it. I will definitely buy this tasty dessert more often and try some of their other products too – you can’t go wrong with Skinny Cow because you can totally have your cake and eat it too! The Skinny Cow Perfect Cup LA Event – Spot On! Every woman enjoys time out with her girlfriends having fun, laughing and just going with the flow. A great example of that was the Skinny Cow Perfect Cup event in LA on Saturday, August 27th. I arrived at the Pacific Design Center during my time slot of 2:00-3:00pm ready to enjoy this GDO (Girls Day Out) with my friend who was already there. She was in the fitting room when I showed up, but that gave me time to observe the scene and jump right in! I was greeted by Skinny Cow staff which led me to check-in. As I walked through I passed white leather plush seating with colorful throw pillows, a photo booth, historical bra displays, makeover lounge, an ice cream bar and ladies all around having a good time. Once I was wristbanded and armed with a buzzer, I headed to the food and drink section. While munching on cheese, grapes and nuts and having a glass of Beringer Moscato, I began to sing and dance because the DJ was playing my fave, 80’s music! A Madonna remix came on and I was in my own little world. Before I bumped into anyone, I made my way to a cocktail table where I could rest my belongings and continue my song and dance. This event was off to a great start and I wasn’t going anywhere! I met some wonderful ladies as I was waiting for my fitting, especially Ashley who happened to be from my hometown of Evanston, IL and currently lives in my hood! We started chatting about Chicago and other things when my buzzer went off. Fitting time! There were over 20 fitting rooms and several staff onsite to help you determine your perfect bra size. Before you reached this point you had to write down your assumed size. Assisted by Mona with my fitting, she was fun to be paired up with since she enjoyed my singing and bopping around. Well, long story short, the size I wrote down was the perfect size! Indeed, I know my body well. So what’s next? I finally found my friend and we headed over to the photo booth to take some fun pictures with props. I selected a colorful boa and white feather tiara for my ensemble with the Skinny Cow cutout. Winners were also being called around the clock for a raffle that continued throughout the day for an Ipod, a free makeover and other prizes. My name didn’t get called, but no worries, still winning! Now it was time to cool off on this hot day with a Skinny Cow ice cream cup. With 5 flavors to choose from I didn’t know where to start! They all looked delicious, but as a lover of chocolate I had to try the Chocolate Fudge Brownie. This was cold chocolate heaven in a cup! I wanted to have a second one, but my stomach wasn’t having it. Finally it was time to wrap things up and pick up my swag bag, which contained a t-shirt, a clear plastic makeup bag with Skinny Cow lip gloss, coupons, and more. I also received my free bra certificate to be redeemed at Macys. Thanks to the sponsors Warner’s and Olga for offering free bras! Overall this was an event I was glad to be a part of and it was well executed!